This is an industrial buttonholer, a rather scary machine for the uninitiated! 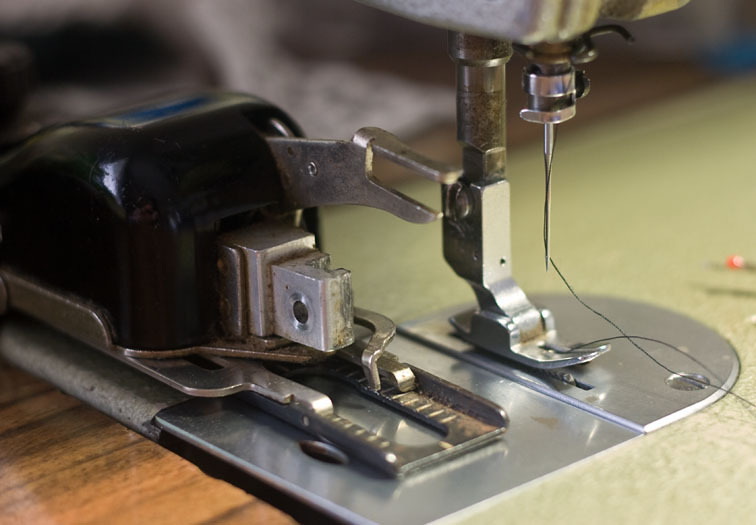 Push one pedal to clamp the fabric in place, push the other pedal to start sewing, and once the sewing is finished the knife comes down and automatically cuts the buttonhole open. A single buttonhole only takes about a second to do, but it sounds like a jackhammer and is definitely the noisiest machine in the factory! 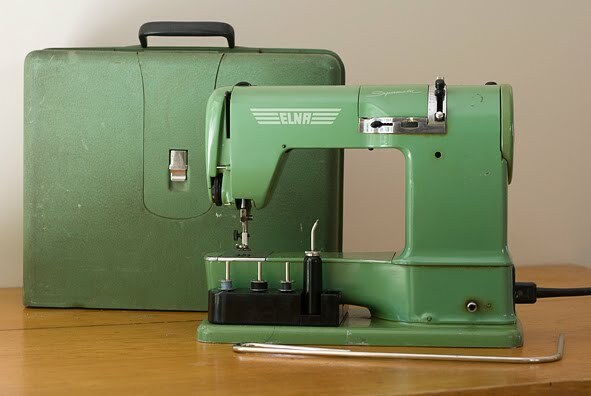 I do have my mother’s 1955 Elna Supermatic that does manual buttonholes – where you select different stitch widths and stitch lengths and patiently work your way around the buttonhole step-by-step, but it isn’t working. Yikes! I was half expecting a spider to crawl out of there! Then I found out it doesn’t fit my machine! It is designed for a low shank and my machine is high shank. After investigating high to low shank converters without success, I came to the conclusion that there was only one other option – to buy another machine….. I love my buttonholer now I’ve given it a good clean-up. 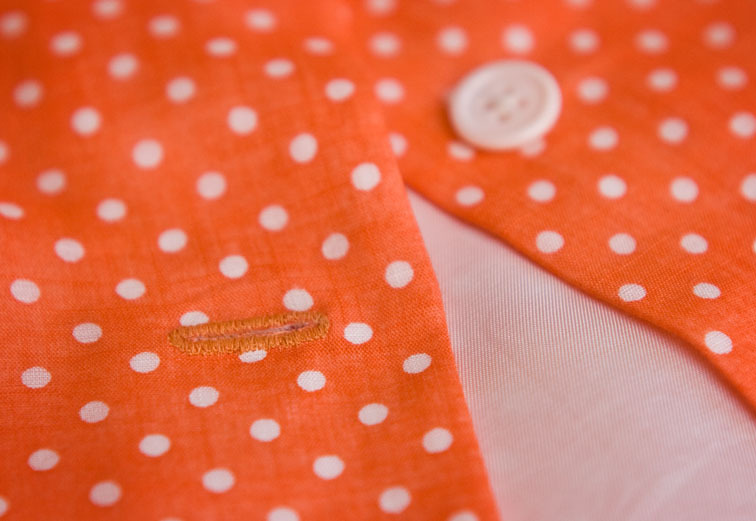 And yes – some of you guessed correctly that was how I did the buttonholes on my Tangerine Tango Top! 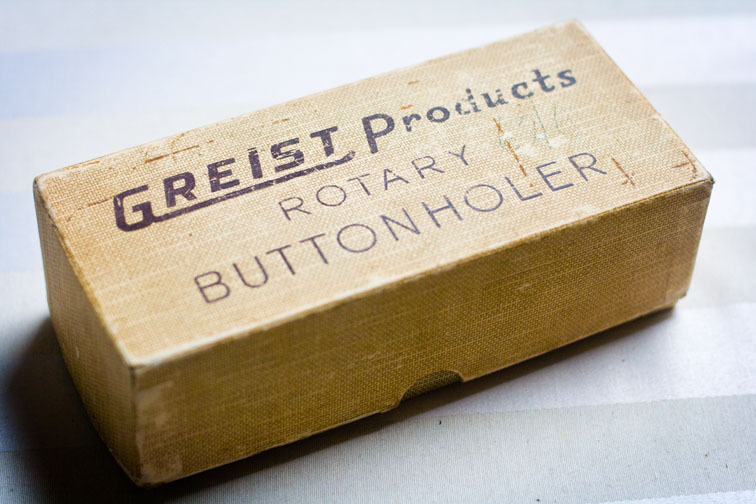 Do you have a Greist buttonholer or similar gadget? What do you think – do you love it or loathe it? I've bought many sewing machine accessories from this seller for my Bernina and have been happy with her products. My Singer buttonholer (much like the Greist) is definitely my Go To attachment for the best looking buttonholes! I usually use it on my Singer 201, but it fits all the old Singer low shanks. Hmmm, how interesting! I didn't even know things like that existed! I have an ordinary very basic 24 yr old domestic Janome that I bought when we were first married, and it has manual buttonholes only. I'll admit to feeling a bit jealous of my mother's and sister-in-law's automatic buttonhole functions, but I think I've perfected my buttonholes over the years so I can't see myself ever upgrading. I do all my buttonholes on a Singer buttonhole attachment! I LOVE it! Very easy to use and consistently good results. Wow, that industrial buttonholer sounds a bit scary!! I have a Singer as well, eventually they expanded the cams to be a set of around 12 that includes keyholes and a single cam for bound buttonholes. Mine is permanently set up as a buttonhole station on a Singer 501A. I never use the automatic button holder on my Bernina, these are so much better! I probably have no clue, but would there be any chance to use this attachemnt with a modern sewing machine? Please let me know anyone!!!! p.s. my daughter just moved to NZ and is loving it! I received a Singer button hole attachment with my Vintage 500A, however, I have not used it yet. Add that to the to do list because I have a computerized machine that makes perfect button holes, every time. I am spoiled, and tend to fall back on my tried and true method. However, I do like the idea of doing the button hole with a smaller stitch and then again with a larger one. I have the Singer equivalent also that attaches to my Grandma's old machine. It was so nice when I figured out how to use it. Now that I have a new machine with an automatic buttonholer (which is fantastic), I don't use it anymore, but I'm quite happy to have it around as a backup. I will join the Singer buttonhole attachment fans – it is the only thing I use. For years I have sewn only with my Singer straight stitch, so no zig-zag or options for manual buttonholes. 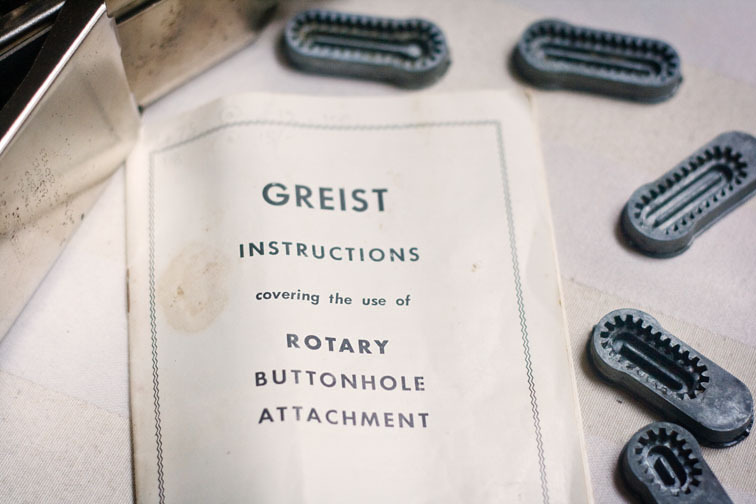 I did a post last year, with a little video http://sunnygalstudio.blogspot.com/search/label/vintage%20buttonhole%20attachment. I even use the tiny template to make holes when I make a matching belt for a dress. They are a tiny bit oval instead of round, but it looks just fine when finished. I've got the Singer version which worst just fine on the Singer Featherweight, is somewhat pointless on the Singer 328K zigzag, and won't work at all with the Bernina, but it might be an improvement over Bernina's buttonhole program. Thanks Jason, that was the one I checked out but it is designed for domestic machines, and she couldn't guarantee it worked for industrials! 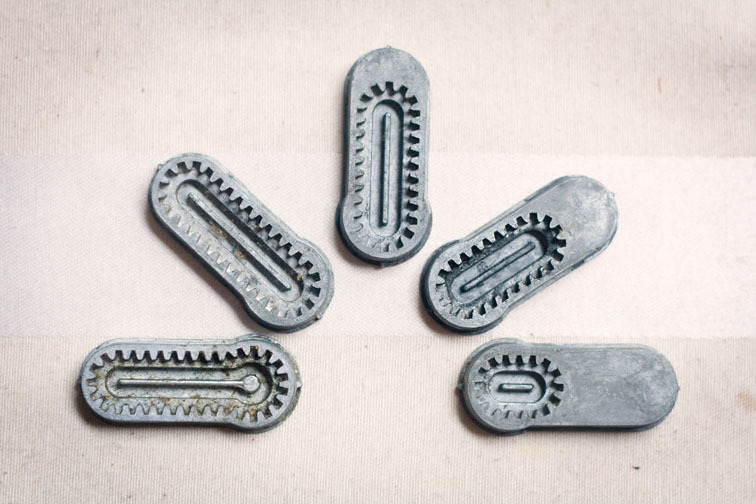 My buttonholer is a low shank one, can you get high shank ones? I'm glad your daughter is loving NZ! I think the instructions mention that somewhere, they say it looks more like a handworked buttonhole – I haven't tried it yet though! I love seeing those cool industrial machines. I don't have a separate buttonholer. My machine has the buttonhole foot and does them automatically. The only problem is that it doesn't go beyond 3cm and it struggles over thick and uneven layers…which means… coat buttonholes are a hand-made business for me. I've had one for years, but never used it until last week! I have a 1950s straight-stitch Morse that is a LOVELY machine, so I decided to try it. It worked beautifully on the first try. The quality of the stitch is so much nicer than my newer plastic Husqvarna's automatic buttonholer. I've recommended the buttonholer attachment to everyone I know. You can even use them on a newer machine, I can't wait to try it on the Husq. Yes you can! Just set it for a medium straight stitch and let it do it's thing. That's brilliant! I have an old Singer 66-8, that I was considering selling, but now I will set it up as a full-time buttonholer. I just picked up one of these for $1. I haven't tried it yet, but I can't wait to see if it works since I usually have to do my buttonholes by hand! I have three buttonholers, a Griest that I bought thirty years ago and still use and two Singers that came with Singer machines picked up at the thrift shops. Contrary to common assumptions, you can make a buttonhole larger than the largest cam. The instructions are in the booklet that comes with the device. It's a bit convoluted and involved so I've never bothered to try it. My largest cam is 1 1/16 which is pretty big. Singer probably has an instruction book for the buttonholer on their website if you need one. It will work with the Griest, which is actually a Singer clone. And what knid of machine did you get that you used to make the tangerine blouse? I “inherited” something similar and a Singer machine to go with it. Having tried it out, I decided that I actually preferred the buttonholes on my regular sewing machine. So, machine and gadget went to Goodwill for someone else to find and love. 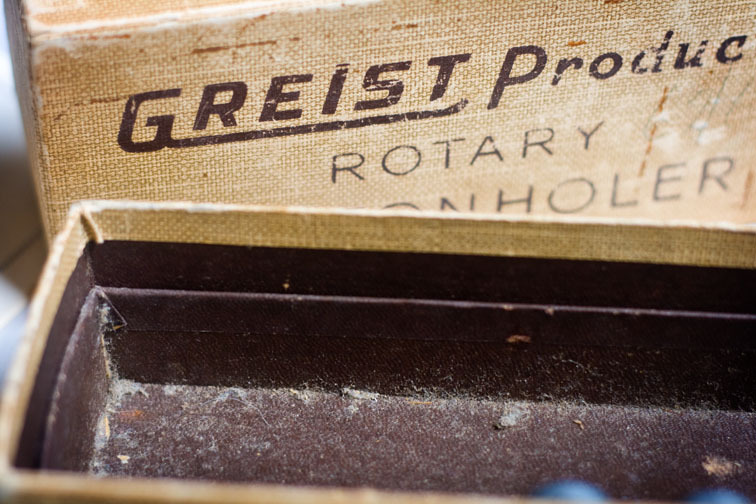 I quite like my Greist buttonholer (I think it's not quite as old as yours…), although it's not the cure-all I had initially hoped it would be. It doesn't work well with my Featherweight as the presser-foot lever hits the top of it, so the foot never comes all the way down. It works a bit better with my modern machine, although it still struggles with coat-weight and denim fabrics. I need to try it out with my Pfaff and my White, as they both have dropable feed dogs which would make using it simpler. Of course, they both also do perfectly decent buttonholes of their own, albeit without a keyhole option or the cute rounded ends. So pleased to find this post and your blog! I have a Bernina record and I hate doing buttonholes on it. If I buy an OS adaptor would a Singer buttonhole attachment work on it? I see there are quite a few listed on Trademe. Also I'm keen to do one of your classes at Western Springs but it might be later in the year? I would love to do a class similar to a sewalong (e.g. a tailored jacket class), you should run one of these! I too have a Singer buttonholer, it came with my thrift store Singer 66-16. The metal templates are interchangeable and more sizes are available. It makes great buttonholes but they're harder to line up than the 4-step buttonholes my Pfaff makes. Guess I need more practice! So did you use this on your industrial? A few years ago I did a little “flowchart” about my adventures in a quest for the perfect buttonhole (http://leanmeansewingmachine.blogspot.com/2009/08/buttonhole-buttonhole-where-can-you-be.html). I still don't have it. I do however have a current Viking, a vintage Singer, a vintage Necchi, a straight stitch industrial and three buttonholers. None are compatable! I haven't given up, just trying think before I buy anything else! I'm not very knowledgeable about what attachments fit what machines. Maybe someone else can chip in with a more helpful answer! I think Bridget is taking bookings for Term 2 already, if that is not too early for you. If the course is popular I am sure they will be held later in the year too, but there are no guarantees at this stage as it is a brand new course! No it didn't work on my industrial, it didn't fit the presser bar and if it did it would sit too high. I would have thought you would have something that worked with all those options you have Dana! Off to check your buttonhole adventures now! I learned to sew on my mother's 1950s White sewing machine, which my father bought for her when she graduated nursing school. It had a buttonholer much like the one you pictured. It worked GREAT! My father bought me a Montgomery Ward machine for my college graduation, and also the buttonhole attachment for that machine. Turns out that all the gears for that one were not metal but plastic, and the only buttonhole I managed to make with the attachment stripped the gears. It never worked again. Have made do with a five-step do-it-yourself method ever since (highly unsatisfactorily). But this has forced me to explore the World of Bound and/or Faced Buttonholes, so I can only be grateful that I am still growing brain cells. I guess. What a cool find! I have memories as a teen of using a Singer buttonholer on my mom's old machine. Last year I found a very nice vintage one on ebay, as my machine at the time only had manual 4-step ones and I really wanted the keyholes. Although it was (I think) the right shank, it also kept hitting the presser bar. Sigh, I hope I find a way to use it someday. Mom's Kenny in the basement has one of these. I never liked the way the button holes look. I much prefer the '60's Kenny and the stitch carefully with the zig zag and adjust the stitches as you go way of buttonholing. They look much nicer. I adore my buttonholer! It's definitely my preferred method. Especially on thicker material. Ooooh! Thanks for the sewing-machine-eye-candy… I wish I had one like that. I was going to use a Singer buttonholer in the pink case, but discovered that it was for a slant needle machine. Darn! But then I remembered the Greist lurking in the back of my sewing cabinet. It's the same one as above…right down to the box. But it didn't have any cams. Good news! The metal Singer cams work with the Greist. Yessss!